I need the 2 tiny little ratchet gears on the stem (the one that sets the time, and the one that winds the mainspring), and one of the 2 screws that holds the cover plate on (the one that goes just below the red circled parts) from a Poljot 2209 movement. The gears i have, have worn out ratchets, and set the time, but will not wind the watch - and the screw is missing(!). See picture for reference. I'm looking for the small spring that pushes the clutch lever into position in a Ural movement. If that spring is a s simple as it looks, it might be best to make a new one. All you need is some spring stock, pliers, small round-nose pliers and cutters. You could also mod an existing spring to fit. Bergeon sells spring stock assortments. In my case I got the flat spring stock. Do you know where I can order this from? Or maybe just the hair spring type? The issue is that the hairspring ot my watch is bad and cannot be fixed. As far as I have heared the coils for these watches are very specific and cannot just be replaced with any other coil, because the watch would not keep time good. I know it is not very easy to find, but I try my luck. 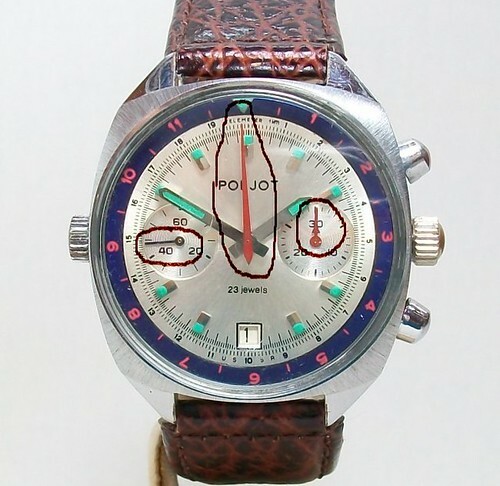 I am looking for my poljot space chrono, centre stop second, sub second and sub stop minute hands. If you have these hands at your stock or spare please mail me at: [email protected]. I do look for paddle hands for an old Vostok amphibian 2209 tonneau case. If someone has, please MP. I am searching an original Strela crown for a Poljot straight hands Strela restoration project.